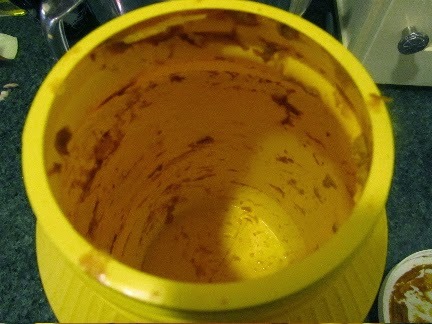 creative savv: Are you sure that the mustard jar is really empty? Are you sure that the mustard jar is really empty? This is the final installment of my leftover bonanza from last weekend. Over the course of the weekend, I emptied over 20 containers, dishes, and jars. That's a lot of leftovers! When it looks like the jar is empty, I pour in about a tablespoon of vinegar. I shake the jar up, then lay on its side in the fridge, turning every couple of days. this softens up any mustard stuck to the sides of the jar. It can then be scraped out at almost the consistency of the original mustard. You'd think the mustard jar could now be pronounced empty. Not just yet. There's usually enough mustard still in there to flavor some more vinegar. On Saturday, I added about 1/2 cup of vinegar to the jar. I shook and I shook and I shook that jar, until almost everything stuck to the sides and lid had come off in the vinegar. 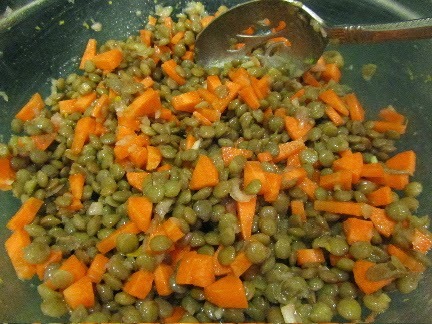 With this mustard-infused vinegar, a half-jelly jar of sweet pickle juice, vegetable oil, and shallots, I made a mustard vinaigrette for a marinated lentil salad. To go with the marinated lentil salad, I cooked some pasta. To top the pasta, I mixed one of those pizza joint, garlic dipping sauce condiments and the leftover pasta sauce from the top shelf of the fridge. 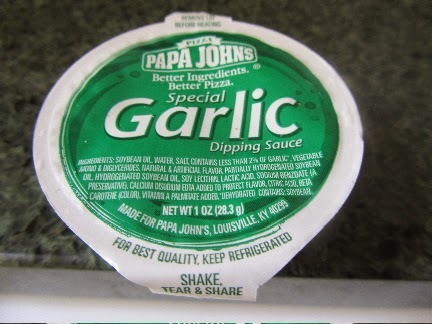 My family thought the garlic dipping sauce really punched up my homemade sauce. 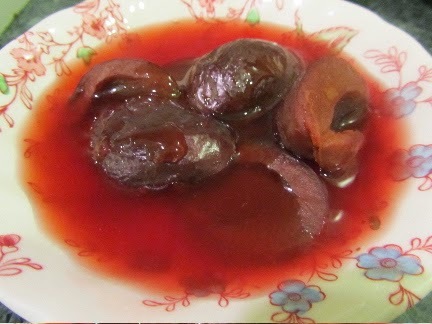 Rounding out the meal was a batch of stewed plums, made with frozen plum halves, the set-aside blackberry juice from breakfast, the rinsings from a jar of blackberry jam (the runny jam that served as syrup at breakfast), and the rinsings from a jar of orange marmalade. In one dish, I managed to empty 3 containers from the fridge and 1 from the freezer. Not bad. Sunday's lunch: or what do you do with two-week old, leftover frosting? 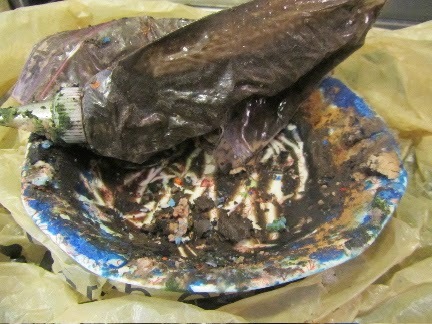 When we decorate cakes, we scrape all the remaining frosting, all colors, into one bowl. It looks a lot like mud at this point, and not the appetizing kind of mud, as in Mississippi Mud Pie, but the greenish kind of mud you'd never think could be appetizing. This frosting is leftover from a cake my daughter decorated a couple of weeks ago. The last icing tube hadn't even been squeezed out. I did my best to salvage what I could from the tube, and mixed it in with the rest of the frosting. It did look like mud. Now what flavor could go with the color of mud? Chocolate, of course! 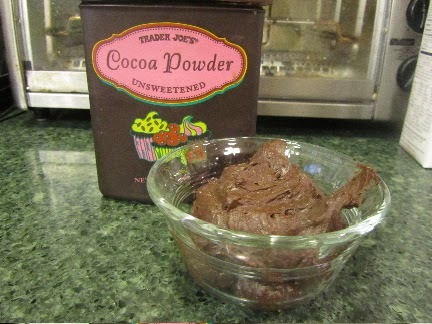 I added more milk, powdered sugar, and cocoa powder, and ended up with about 1/2 cup of chocolate frosting. In the fridge, I also had two "empty" peanut butter jars. 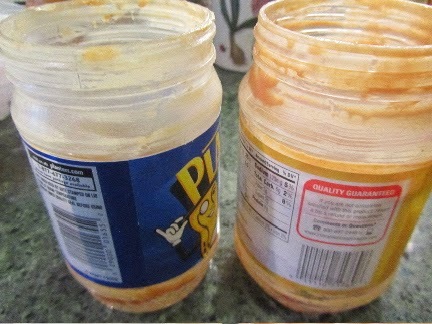 I was able to scrape out about 1/2 tablespoon of peanut butter from these two jars. 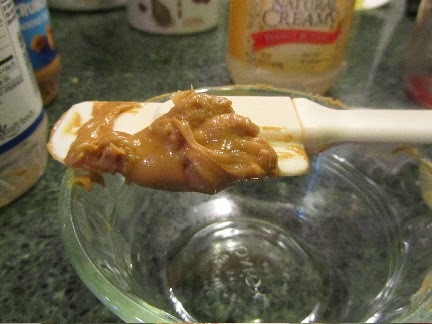 Add that to peanut butter from a fresh jar, and we had the makings of lunch. For lunch on Sunday, I made . . . drum roll please . 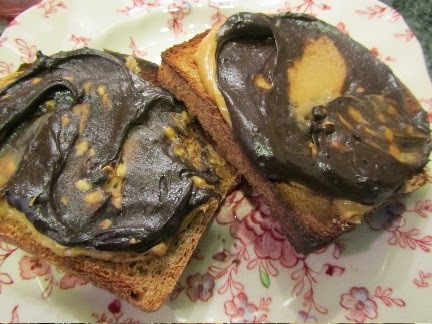 . . peanut butter and chocolate frosting sandwiches -- aka Reese's sandwiches. They were very yummy, but a tad on the dessert-y side. At the end of the weekend, this is what the fridge looked like. While not completely cleaned out, it's quite an improvement. Anyway, I have a family to feed. An empty refrigerator was not my goal. My plan was simply to use up odds and ends before they would spoil. I think sometimes we lose sight of what our aim is. If you have a household to prepare meals for, then spartan-looking fridges work against that purpose, not towards it. This was a fun challenge for me. 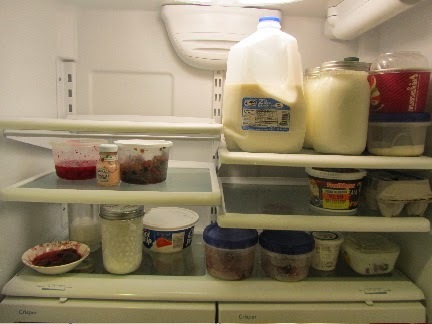 I was amazed by how much of our meals I could make from leftovers and near-empty jars. And I think the creativity that went into our meals made them more lively. This weekend, not so many leftovers to use up. But I am working at the church tea tomorrow. Who knows what leftovers I'll be bringing home from that event?! 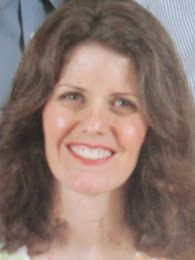 I enjoyed reading your frugal adventures! I remember when my children were small I would take empty jam jars and add milk to them - shake up and pour into popsicle molds (an Amy Dacyczyn suggestion). My kids loved them. I think it's fun to see how creative you can get with just what is on hand. I love the challenge! Thanks for sharing! It is fun, isn't it?! It's a form of expressing creativity, which I think we all have an inner need to perform. You know, it takes a special kind of person to appreciate reading about others' frugal adventures. Some folks would be bored by this sort of stuff. I'm glad you enjoyed reading! Thank you! I love the "gourmet" label. The next time a family member has a puzzled look on their face when I'm preparing and serving one of my creations, I'll throw the gourmet word around a bit! I've been reading your blog for several months now, but have never left a comment. I feel like I am coming out from the shadows. I have so enjoyed reading your blog. You have inspired me to try many new things, and use up every last bit. Keep it up! Thank you! I'm very glad that you enjoy my blog. I learn a lot from all of you nice people who comment here. So please share your tips, as well. Black olive juice is really great, IMO, added to soups and pasta sauces. I haven't tried canned mushroom brine yet. Next time I have some canned mushrooms, I'll give that a shot. 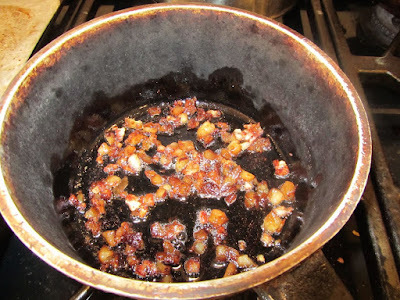 I once saw a frugal cooking segment on a TV show, where the woman was using oil from canned tuna packed in vegetable oil. She was marinating a vegetarian meat-like substance, to make it taste like seafood. She then deep-fried these pieces and called them mock popcorn shrimp. I'm not sure I'd ever try to use the liquid from canned tuna. But it's an option for adventurous souls. I enjoyed reading the installments of "The Cleaning of the Refrigerator Jars". I can tell that you had a lot of fun and satisfaction doing it. How often do you do a clean out of things like this? now there's a good title for my series of posts! I hope it amused you as much as it does my family! I usually try and clean out jars on a regular basis, so I don't have a glut of them to deal with. Someone in the house kept opening jars of jam, without finishing off the old ones first. Combined with we've been finishing off all the homemade pickles, plus eating the homemade yogurt as fast as I can make it. I just had a lot of jars to deal with last week. My canning jar cupboard is now near bursting! Loved this post! while I don't purchased such large pots of mustard, what I do when they are "empty" is to add some homemade vinaigrette out of the salad dressing jar, cap it, swish it around to "clean it" and voila! 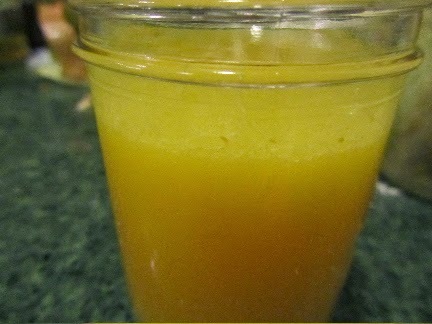 mustard infused salad dressing! my family vinaigrette recipe calls for a T of Dijon as it is! Works well for me. Your overcrowded refrigerator moved to CT! I recently stocked up, unexpectedly, and my smaller sized, kitchen refrigerator is bursting! Gotta work on leftovers this week! and use it up before we lose it! I have 1/2 of a baked butternut squash, for example, which I will convert into "pumpkin" bread. I often substitute butternut for pumpkin so this will work out fine. It's just me for the next 2 days as DD is away visiting friends, older son who has his own apartment will stop in for laundry (ok, I may be able to pawn something off on him) and twins are with Dad for visitation. Gonna be soup, and leftovers going into next week, for sure! It sounds like you had some serious eating to do at your house! But what a wonderful thing abundance is! Our fridge managed to fill itself back up over the weekend. But that should make for easier meal prep for the next few days. Hope the snow melts in your area soon! I'm amazed by how much you've managed to get out of your leftovers! I will definitely be looking at the jars in my fridge with new eyes! It's satisfying to get just a bit more from an almost empty jar! I'm sure you'll find the same satisfaction.